District Heating Pipeline Network Market size in 2016 was valued over USD 400 billion and the cumulative installation is set to exceed 850 thousand Km by 2024. Increasing government measures pertaining to carbon emissions coupled with ongoing adoption of heating systems will drive the district heating pipeline network market size. Rising space heating demand along with growing penetration of sustainable energy sources will further foster the business landscape. The U.S. EPA in 2016, released the Carbon Pollution Standard under the Clean Air Act to check and monitor the sulphur and carbon emissions across the region. Low maintenance cost, higher efficiency, longer life cycle and reduced heat losses are some of the key parameters that will boost the district heating pipeline network market share. Increasing use of more efficient insulating material along with ongoing government subsidies and incentives will boost the business growth. The UK government in 2015, introduced a Heat Network Investment Programme to invest USD 372 million toward the development of 200 new DH networks in Wales and England by 2020. The pre-insulated steel pipes witnessed a significant growth owing to its ability to withstand high temperatures of around 1200 C and above. These are rigid steel pipes bonded with a polyurethane foam with an outer covering of HDPE material and are available in wide range from 20 mm to 1,200 mm. The polymer pipe is set to grow pertaining to their increasing demand as an efficient alternative to its competitive counterparts. Ease of transport, low carbon emissions, corrosion free and increasing use as service pipe are some of the key parameters which will stimulate the district heating pipeline network market growth. The product is primarily the PP-R and PEX pipes and can easily be used at constant temperatures up to 950C. The 20 – 100 mm diameter pipes in 2016 accounted for over 15% of the global district heating pipeline network market share. Growing demand for DH systems across the residential establishments will complement the industry outlook. The product finds its wide usage as a service pipe as they can be easily rolled, transported and installed in the buildings. The 101 – 300 mm diameter pipe is set to witness strong growth on account of its increasing usage as a primary heat transfer medium across the space heating network. 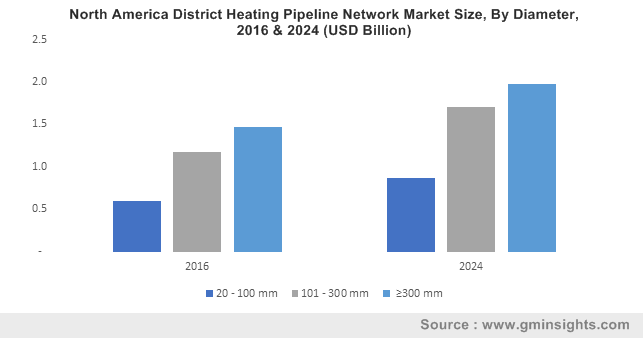 Growing investments toward commercial and industrial establishment across the developing nations will augment the district heating pipeline network market share. Residential district heating pipeline network market is predicated to grow over 4% by 2024. Rapid urbanization across the emerging economies coupled with favorable government assisted renewable establishments will foster the business outlook. The growing adoption of small scale heating systems in the suburban areas has further led to the installation of heating networks across the application. 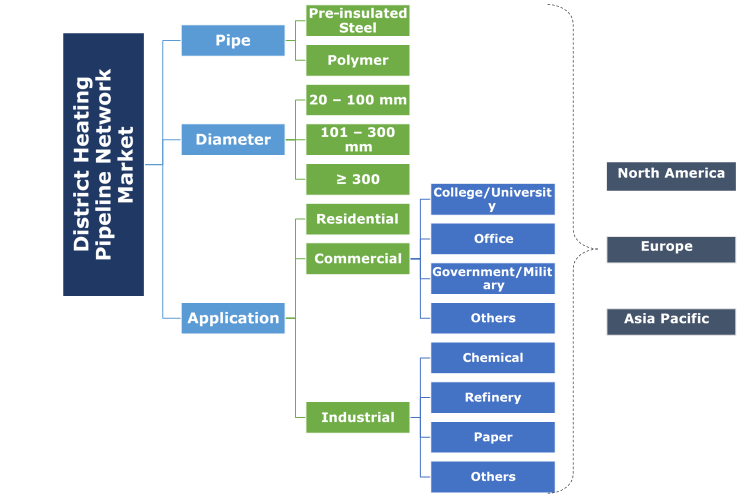 The commercial district heating pipeline network market is set to grow on account of rapid commercialization across the developing countries. Introduction of stringent building emission norms along with increasing investments toward development of efficient building systems will propel the industry outlook. The Chinese companies in 2016, invested USD 33 billion, an increase of 53% in various commercial establishments across the globe. U.S. district heating pipeline network market is set to grow on account of rising heat demand from residential and industrial establishments. Introduction of strict government norms toward carbon emission will positively impact the business outlook. In August 2015, the U.S. EPA released carbon emission standards for new power plants. The initiative incorporates the NSPS standards to restrict the emission of CO2 from coal-fired and natural gas stations. Government norms pertaining to decarbonization of buildings owing to rapid deployment of sustainable energy technologies will foster the UK district heating pipeline network market. Increasing investments toward smart buildings along with various government initiatives including EPBD, ELENA Facility and SFSB will further drive the business landscape. The Government of UK in 2017, announced an investment of USD 414.5 million to develop the DH network across the country. Eminent industry players across district heating pipeline network market includes Uponor, Logstor, REHAU, BRUGG, Perma pipe, Microflex, Aquatherm, Flender, Thermaflex, Smithline, Huntsman, CPV Ltd, Golan Plastic. Growing investments toward innovative product launch along with strategic associations to increase their presence has been a key strategic inference by key industry players. Decline in pipe cost over the years and economies of scale in long run has also established strategic platform for development. District heating pipeline network is used to transport thermal energy/heat energy from the source of generation to its application. The pipes used for the transportation of heat includes pre-insulated pipes of steel and polymer. Purified water is primarily used as a formation fluid owing to its specific heat capacity. The pipes have an outer covering of polyethylene with an insulation of polyurethane rigid foam.